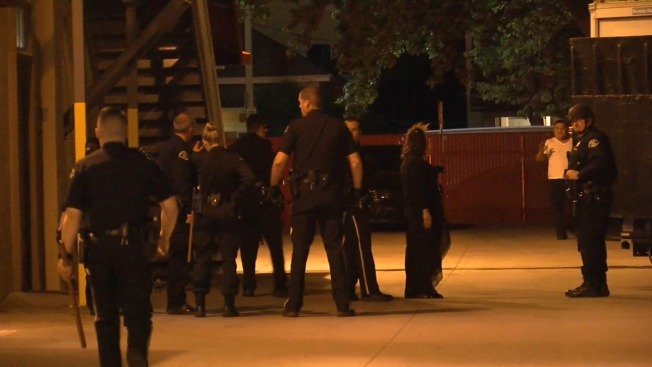 A wedding celebration in San Jose Saturday night swiftly changed course when a bloody melee broke out, according to police. Officers responded to the area of East Santa Clara and 27th streets just after 9 p.m. and found a large group of people entangled in a brawl. Video depicting the fight's aftermath captured several police officers outside the wedding hall named S.F. Nova Alianca wielding batons in attempts to keep the peace while some guests dressed in wedding garb restrained one another. One wedding attendee was spotted with blood soaked into his dress shirt and vest. At least one person was injured and transported to a local hospital. It is unclear if any arrests were made, but police continued Sunday to investigate the fight. An employee with a nearby wedding planning company was shocked to hear about the chaos, and he added he has "never had any issues" with the venue or its guests. "I've had several events there," Orlando Guzman said. "Always pretty calm. The owners are pretty calm. There's always police officers on site." Events held at the hall where the fight broke out require an off-duty San Jose police officer to be on site and act as a security guard, according to Guzman. More officers are required if the event crowd exceeds 100 people.